Exceptionally tall Dune Helleborines growing in Newborough Forest (adjacent to Newborough Warren National Nature Reserve) in Anglesey, North Wales. Plants in the exposed sand dunes are much shorter. Patience is required when going to see the Dune Helleborine because even when the flower spikes appear to be fully formed it can be several weeks before they open. Dune Helleborines are frequently described as boring or insignificant because of their small flowers, but a good specimen is a magnificent sight, growing up to a metre in height. Plants that grow aming dwarf willow in the dune system at Newborough Warren National Nature Reserve in Anglesey and in other more exposed places tend to be much shorter because of the effect of the strong winds. Dune Helleborine has pale green-to-yellowish leaves which protrude from either side of the stem and an acute angle. The flowers are pale greenish-yellow and the lips are faintly washed pink. Good numbers of Dune Helleborines are found on Anglesey, but they also occur in coastal habitats further north in Lancashire, and in Cumbria where they grow in Sandscale Haws Nature Reserve. This orchid is endemic to Britain. 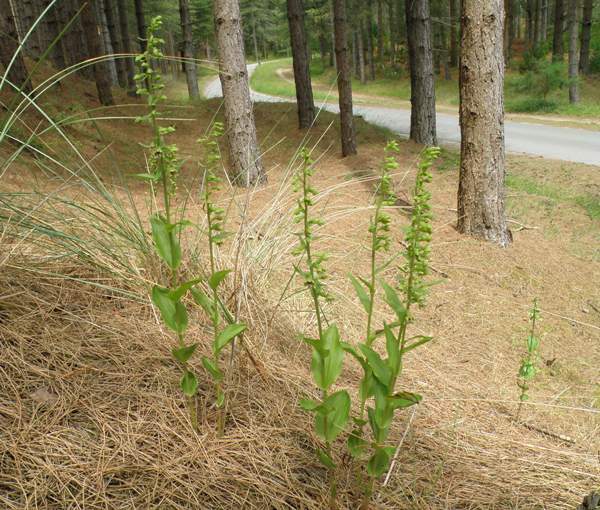 Dune Helleborine is found in damp dune slacks where it grows through creeping willow scrub. In Anglesey it has extended its range from the dune system and into the adjacent pine forest where the plants are sheltered and grow much bigger as a result. This late-flowering orchid is at its best in July and early August. 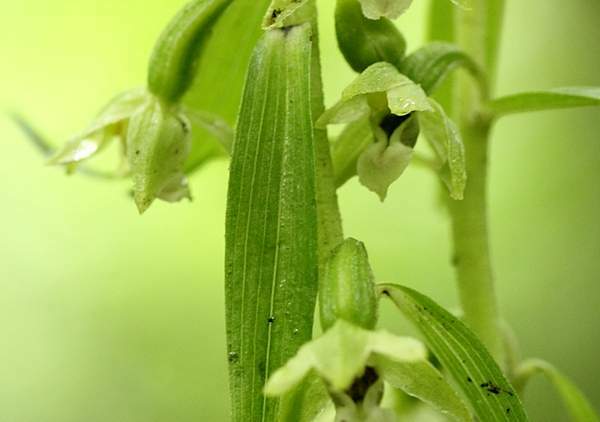 The Tyne Helleborine has no formally-accepted scientific name although some refer to it as Epipactis dunensis subsp. tynensis. 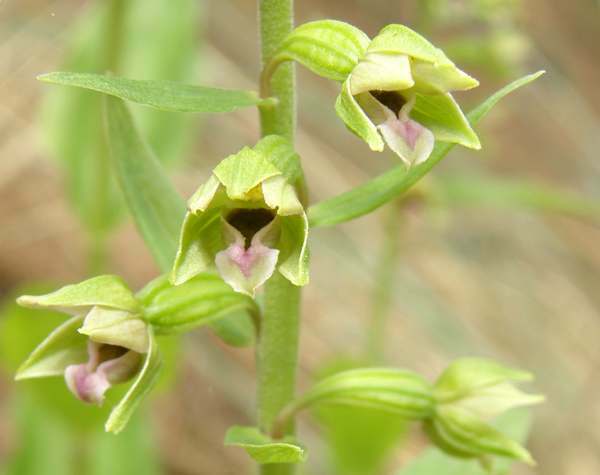 It is very similar to the Dune Helleborine and is differentiated by its smaller flowers which are a darker green and have a white lip. The hypochile (the cup-shaped part of the lip of the flower) is dark brown. The flowers resemble those of the Green-flowered Helleborine (Epipactis phyllanthes) when in bud, but they open more fully and more quickly than Epipactis phyllanthes. The Tyne Orchid occurs inland in Northumberland and is also reported from old coal mining sites and woodlands in Scotland. It flowers in late June and July. Genetic studies may help us to understand the differences between Epipactis dunensis, Epipactis leptochila (Narrow-lipped Helleborine) and the Tyne Helleborine, and also more about their true origins, but for now we must struggle with almost indescernible morphological differences which are frequently blurred by plants that are intermediates between species.